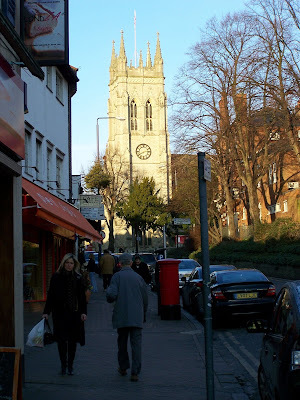 Once a small settlement referred to as Bacheham in the Domesday Book, Beckenham has been swallowed up by suburban London. Its meandering high street has the usual bars, eateries, charity shops and estate agents to be found in many other parts of south east England. But there is the odd gem: Village Fine Sausages and Pinksy's - they sell possibly the best Chicken Soup this side of the Atlantic! The Parish Church is dedicated to St George (he of dragon-slaying fame and patron saint of England) but, in the grounds, is this celtic cross. It seems far from home. 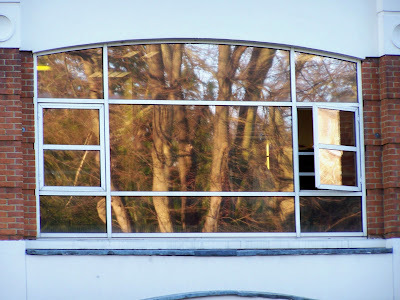 I caught the reflection of the trees in the churchyard in the window of Mark's and Spencer. I want to go there! be there, walk there. I will have to add this neighborhood to my list of places to visit when I visit london. must try the chicken soup at a place called pinksys! and I love the celtic cross. I used to live in Beckenham, up near the Robin Hood. 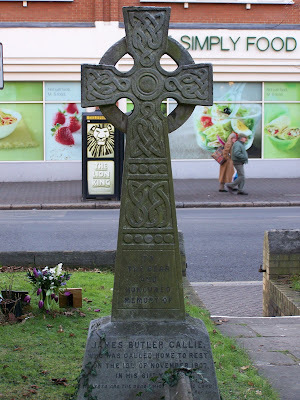 I never saw the Celtic Cross, although I was familiar with a good number of Beckenham's charity shops. Will look forward to seeing more SE London local things I cannot see under my nose. AR - anytime you're visiting, it would be my pleasure! kimy - you too! I would love to buy you chicken soup in Pinksy's. Yay!! You're planning to visit London?? Glory - Welcome! Nice to meet you.